Recognized as the official state flower of Kansas in 1903, Sunflowers are known scientifically by the genus name Helianthus, from the Greek words Helios, meaning “sun” and Anthos meaning “flower”. They are related to other flowers such as Daisies, Marigolds and Black-eyed Susan’s, all of which are members of the Compositae family. The stem is thick, hairy and light green with leaves that are large, rough, toothed and heart-shaped. Sunflowers can grow from 2 to 10 feet high with the flower heads measuring from 3 to 14 inches in diameter. The sunflower is a native plant with the American Indian first using this brilliant flower in artwork, pottery and ceremonial rituals. 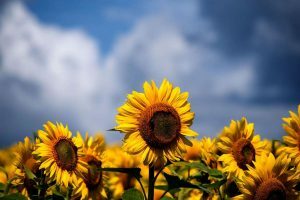 Sunflower seeds have been found at several archaeological sites in the United States including prehistoric sites in Arizona, where several sunflowers disks have been discovered. The sunflower was also highly regarded by the Aztecs with displays of sunflowers in their temples of the Sun and adorning priests with sunflowers for their crowns and carrying them in their hands. Medicinal purposes of the sunflower are wide and variable. It has been mentioned in history that sunflowers cured snake bites and pulmonary infections such as respiratory ailments like bronchitis, coughs, colds, whooping cough, laryngitis and pleurisy. In addition, sunflowers have been utilized to treat stomach worms, remove warts, rheumatism, improve appetite, fatigue, dermatological conditions, chest pains and fevers. Sunflowers have also been known to be used as a disinfectant for cuts and wounds. Sunflower seeds and sunflower oil are delicious food sources. Roasting sunflower seeds to make a coffee-type drink is an alternative for some. Sunflower seeds also produce delicious nut butters and nutritious breads. The Chinese have used the fiber from the sunflower stems to make fabrics and paper. Sunflower oil has been used in cosmetics, dermatological applications and as an additive to many capsules used in supplements. Sunflowers have also been used as fuel, feed and/or wash for livestock and soil fertilizer. So as you are enjoying the end of our summer season and see a sunflower growing, remember its many medicinal, culinary and pertinent purposes.